This stately upholstered bed will add great style to your bedroom with a low profile and a grand curving headboard. 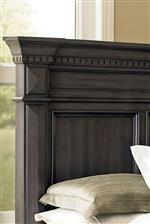 The headboard features deep diamond tufting and oversized nailhead trim. The bed has turned feet finished in a smooth grey, corresponding with the storage pieces from this collection. The Garrison Queen Traditional Upholstered Bed by Standard Furniture at Standard Furniture in the Birmingham, Huntsville, Hoover, Decatur, Alabaster, Bessemer, AL area. Product availability may vary. Contact us for the most current availability on this product. 86351 Headboard, 5/0 Uph Bed 1 17" 66" 58"
86352 Footboard,w/rails 5/0 Uph Bed 1 82" 66" 58"
The Garrison collection is a great option if you are looking for Transitional furniture in the Birmingham, Huntsville, Hoover, Decatur, Alabaster, Bessemer, AL area. 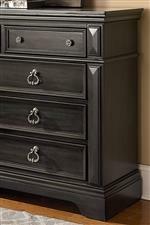 Browse other items in the Garrison collection from Standard Furniture in the Birmingham, Huntsville, Hoover, Decatur, Alabaster, Bessemer, AL area.